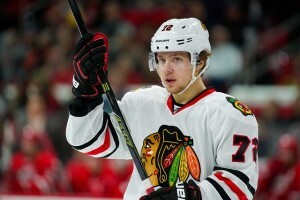 Are the Chicago Blackhawks about to repeat ? On Thursday, Feb. 25, 2016 the Chicago Blackhawks re-acquired forward Andrew Ladd. Are there even bigger deals to be made ? Carolina’s Eric Staal is rumored to be on the move, as is Loui Eriksson of the Boston Bruins. Meanwhile, the Toronto Maple Leafs continue clearing salary cap space – How might it all play out ? Take a look ! Talkin' Hockey 2016: Trade deadline deals from Inside Sports on Vimeo. This entry was posted in NHL and tagged artemi panarin, boston bruins, chicago blackhawks, gary bettman, hockey, loui eriksson, montreal canadiens, NHL, toronto. Bookmark the permalink.